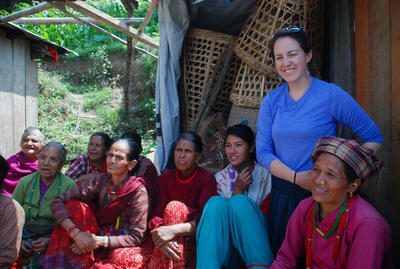 ERG alumna Katie Epstein (MS’ 16) along with Jessica DiCarlo from the University of California Berkeley, Govinda Paudel and Bikash Adhikari from Forest Action in Kathmandu, an NGO working with community based forestry, and Assistant Professor Inger Elisabeth Måren from University of Bergen ventured to Charikot, Nepal to explore which farming systems fared better or worse after the earthquake that struck in May. Katie and Jessica will spend all summer in the field to finalize this work. Read more about ERGie Katie Epstein (MS ’16) here. Read the whole article written by Assistant Professor Inger Elisabeth Måren here.